WE NEED THE HALLOWEEN FEELING MORE OFTEN! I loved Halloween this year! I was in Michigan visiting my Mother and couldn't believe how Michiganders rocked out--challenging times and all! Everyone knows that Michigan has, and still is, going through tough economic times but you wouldn't have known it on Halloween. As I walked around my Mom's neighborhood I saw houses whose front yards had been turned into cemeteries!I heard the song the MONSTER MASH being played through windows and I saw huge spiders crawling up the sides of chimneys. I saw Lady Gaga and Barak Obama trick or treating not to mention assorted ghosts, goblins and dogs who were dressed for fun! Neighbors were gathered around movable fireplaces in their driveways (living in New York City I had never seen these before!) and adults and kids both were heavily costumed! In fact the couple in the picture don't have kids, but had their house and themselves all decked out! Now some of you might be thinking, this is what happens when you have too much time on your hands, but truthfully these people were having fun...and allowing for everyone else to have a great time too! 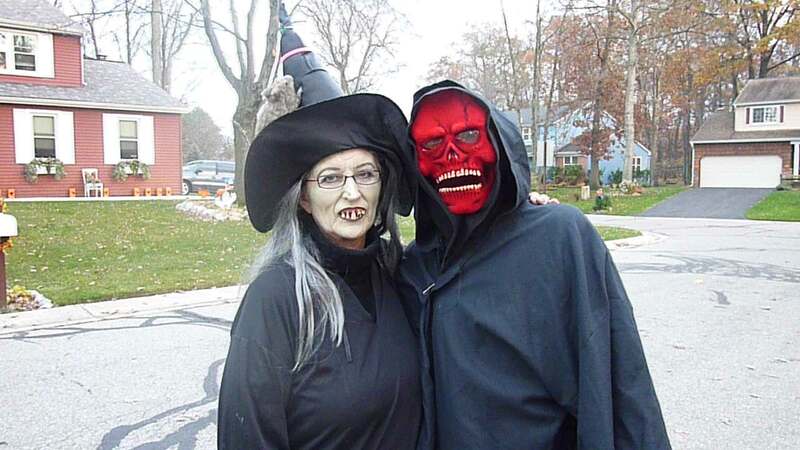 People were letting loose and the attached article from The Detroit News says it all: Halloween Weekends Raised Spirits. Did you laugh enough on Halloween? Get into the spirit? If you did, then I say keep it up and find ways to laugh more...and by the way you should know that it only takes 4 muscles to smile and 13 muscles to frown! :)Maybe we need to rewire our fun!